My friends and I were looking for something Halloweeny to do on the weekend before Halloween. We saw that there was a haunted house in White River Junction, Vermont which was about a two hour drive for us. When we got there, we realized it was closed. We also realized we didn't want to go in, as the haunted house was a regular looking house in a suburban area which made it way creepier/scarier. And the house had this really scary clown picture draped across one of the windows. Anyways, we were looking for something else to do so we decided to go to this costume store in West Lebanon, NH (a fifteen minute drive). The costume store was very expensive so we went upstairs to the clearance section. I found this poodle dress in clearance for 50 dollars. 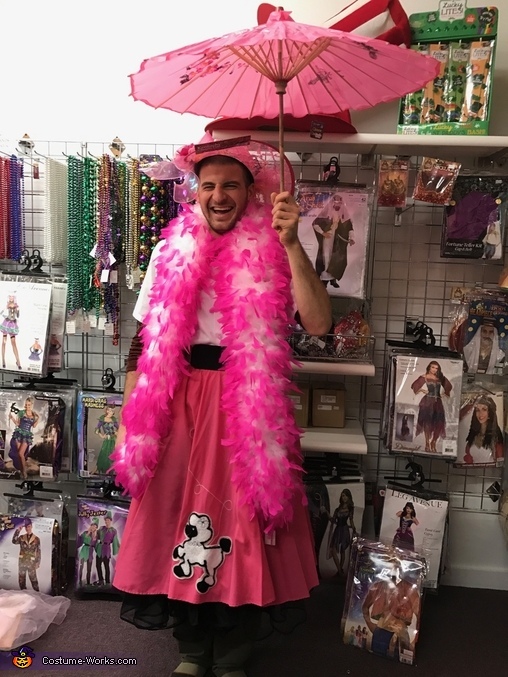 Then found all these pink accessories nearby so the costume came out to 100 dollars. My friends and I thought that was way too much to pay for the outfit so we weren't going to get it but then the owner of the store said he would give it to us for 80 (still too much) and then one of the employees named Bill pitched in 20 dollars which was an incredibly nice gesture so I only had to pay 60 dollars for everything. I told Bill that if I win any costume contests, I would give him some of the winnings. He only asked for 25 percent but I am going to give him 50 percent if I win anything. He was super enthusiastic and helpful when I was looking for a costume even though he didn't have to be which I thought was so awesome. I got pink fishnets and black woman slippers/shoes that were way too small for my feet at a liquidation/discount store in Williston, Vermont. An employee of the store was kind enough to come out and take a picture of me. I took a picture in a ditch because I thought the prairie grass made it seem more old fashioned. The photos of me riding the bobcat were taken at the UVM campus because I am "Trudy Powers Goes To The Kentucky Derby" and that was the closest thing we could find to a horse. Surprisingly there was no one on Church Street (the most popular street) in Burlington, VT on the night of Halloween. We met some people from North Carolina who were playing Halloween techno music and we all walked down the brick paved road (Church Street) like Zombies which was pretty funny as you wouldn't expect a woman in a pink dress with an umbrella to be walking like a zombie. Overall, it was a really fun night and I would love to do well in this competition for Bill!! !